How expensive is the NYC subway? On March 3, 2013, the single ride fare on the NYC subway rose from $2.25 to $2.50. Some uproar ensued and the NY Daily News ran an article about furious straphangers asking people with unlimited Metrocards to give free swipes . But how expensive is the subway really? The subway opened in 1904, and a trip cost 5 cents. The price did not change until 1948, when it doubled to 10 cents. 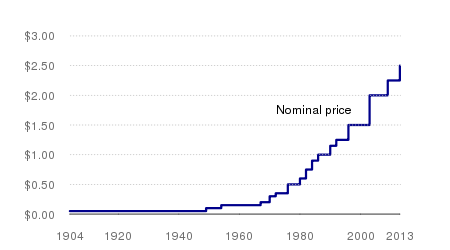 After that the price climbed steadily, passing $1 in 1986 and $2 in 2003 . Figure 1 lists the historical prices of single fare rides, in nominal terms (the actual price you had to pay in dollars for a trip). So it looks like subway prices keep climbing, but that does not take into account that one dollar today does not go as far as one dollar five decades ago, due to inflation. Using the consumer price index (CPI) we can calculate how much a 5 cent ticket back in 1904 would cost in today’s dollar value and we see that it’s actually $1.35 . Thus the real value of 5 cents in 1904 in 2013 dollars is $1.35, when adjusting for inflation. Figure 2 graphs the real prices of historical subway fares as measured in today’s dollar value.